Blessings to you. Today, Jesus came to me at Mass. 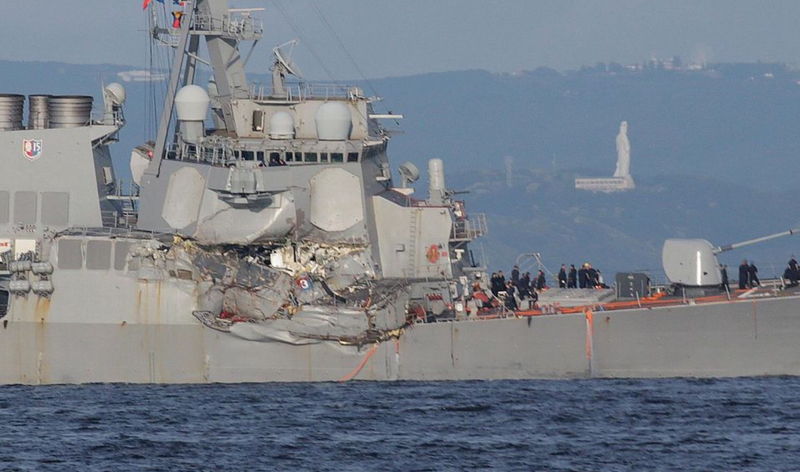 He asked me to tell you that the shipping accident with the Destroyer Fitzgerald was not an accident. It was a provocation from an enemy of the USA using a new weapon which disables the electronic field of the ship. Jesus says to watch carefully as the enemy will do this with other situations to force the USA into confrontation. Jesus is very pleased with you Mr. President. PROPHECIES OF RECENT TIMES — WHERE ARE WE AT? 12 March 2017 (750) – Our Lady: Children, the events in Rome in My Divine Son’s House – with a Great Division and Schism – will come soon. The War of the great Super Powers will be in full swing once you see the Northern Sky alight with a super borealis. The world will soon go into great shock as God divides the Plates. A decision is looming for My Holy Place of Medjugorje. Pray for China and Asia, as sad days are coming in this Region. Pray for Japan – a major earthquake. 8 January 2017 (749) – Jesus: From the world that is outside the atmospheres of this Planet, danger lurks for the world – fire comes closer to harm this world. Israel: The enemy waits to crush you – the Golden Dome will be your sign. 16 December 2016 – Jesus: ISIS Headquarters was in Libya. 26 December 2016 – Jesus: Next year the world is going to have great convulsions – Great Signs in the Vault of Heaven. The Magnetic Grid would be affected, causing the Electronic Highway to be disabled. War will break out in the Indochina Sea, involving China, Taiwan, Japan and the United States. Revolution will come to the U.S.A. – surrounding the border of Mexico and the U.S.A.
A major earthquake will come to Chicago. 8 December 2016 (747) – Our Lady: The Church will soon go into crisis, as a major division will occur. My son, who sits upon the Throne of Peter, is misleading Our children. Terrorism will strike hard in several cities of the U.S.A., Germany, Italy, Spain and England. Next year is one of many Miracles. 13 November 2016 – Jesus and Our Lady: Re. Donald Trump – The enemy will seek vengeance and try to prevent Our son from sitting on the Throne of the Presidency, through various means: By arousing the crowd to violence, disorder and anarchy – to bring about a division amongst the people, so that the enemies of the U.S.A. will strike. 21 October 2016 – Jesus: I, as your God and Creator, wish you to understand that I support Our beloved son, Donald Trump. Much will change in the world when your communication has been removed and you will be living like in the times of hundreds of years ago, without power. 16 October 2016 – Jesus and Our Lady: A large Comet is approaching the Earth and this will become the second Sun. The Sun will eject a Major Flare; it will distort the Magnetic Field of the Planets. There is a plan to attack the U.S.A.
3 September 2016 –Our Lord: People of Australia: Your freedom will be for not much longer. The Earth will quake – the Sea will rise. To My children of New Zealand: Move away from the areas where the volcanoes lie. The ‘Sleeping Giant’ will erupt. The Great War begins in earnest with Russia invading Europe; China invading Asia and the U.S.A. invaded and attacked. 9 August 2016 – Jesus: Secret Societies – led secretly by the Antichrist – have prepared their armies for the Third World War: The destruction of the Golden Dome – the invasion of Israel – the Nuclear destruction of Iran – the Invasion of Europe by Russia – the attack from China in the region of Asia – the attack and invasion of the U.S.A. by Communism. 13 July 2016 –Our Lady: There is huge Star getting closer to your Solar System; men will be astounded. 6 July 2016 – Jesus: The Asteroid is coming and millions will die; Tsunami will be driven to 100 metres high. 13 June 2016 (737) – Eternal Father: You therefore have left Me no alternative but to chastise you: Rain that floods your Earth; The Sun dances and will draw nearer to man to scorch the foundations of men’s arrogance. Stones of the Solar System will hurl at man’s constructions. The Chair of Peter will be empty, for Russia will advance upon the Eternal City, as its armies over-run Europe, Scandinavia, Norway, Sweden, Estonia, Latvia, Poland and Germany. The Ukraine will be the entrance point. Civil War will break out in America and War will come to Mexico. The Middle East will explode into the major War. God will send the Asteroid and Meteors to stop the carnage. The U.S.A. will fall and Communism will rule. China and Korea will invade with missiles. Indonesia will march, attacking Papua New Guinea and Northern Australia. 5 June 2016 – Jesus: Volcanoes would erupt in Italy – Vesuvius, Mount Etna, Hawaii, Guatemala, Mexico and Iceland. The Antichrist will replace Pope Francis. Meteorites would hit Sydney Harbour. Islamic attack upon Paris – the Eiffel Tower. A well-known Leader will be assassinated. 18 May 2016 – Our Lady: A Great Schism will enter the Church; Directions from Rome. 24 March 2016 – Our Lord: Terrorists will strike many countries, including France, Germany, the U.S.A., Spain, Indonesia and Australia – even the Middle East. 13 March 2016 (733) – Our Lady: The Leaders of God’s Houses and those in high government places, are so far from the Truth of God and His Commandments, that they lead Our children astray. Know this, My sweet children, the world Media do not speak the Truth, nor do those in government. 10 March 2016 (732) – Jesus: Pope Benedict and Pope Francis will die. The Chair of Peter will be empty until the Antichrist will take the Throne. Russia to invade Sweden and Norway. Ireland will sink under the sea. Israel attacked and the Dome destroyed. Papua New Guinea will be invaded by Indonesia. Tunisia to become headquarters of ISIS. The events in the U.S.A., if men do not pray: The invasion by China and Russia of the Americas through Alaska and Mexico. Japan will be attacked by China. Japan will have a major earthquake due to the volcano Fuji. The Atoll Island created by China, near the Straits of China and the Philippines, is being built for establishing a Nuclear Base and a means to attack the shipping movements, for military gain. There will be a new Seer for Ireland at Knock. Palestine will be attacked; Lebanon will be attacked. An American warship aircraft carrier will be attacked in the China Sea area. God’s children will undergo the life of Saint Job. 13 February 2016 (731) – Our Lady: The Sun, My son – the Sun: All electronics will stop and the satellites will fall. 5 February 2016 (730) – Jesus: Volcanoes will erupt simultaneously around the world, creating a dark ash-like cloud, darkening out the Sun for many days. Terrorists will try to blow up the Eiffel Tower, the Statue of Liberty and St Peter’s Church in the Vatican. Jesus gave us the countries of the volcanoes: Iceland, Sicily, Japan, Mount Fuji, Hawaii, Guatemala, the North Island in New Zealand, Indonesia, Island of Reunion; one in Africa and one in the Pacific Ocean, in Papua New Guinea, Mexico, Argentina and Italy. Two Great Disasters in two cities: Singapore and Hong Kong. 8 February 2016 – Jesus: An earthquake in the Atlantic Sea will cause flooding; also in the Antarctic, allowing a large piece of ice to break away, causing havoc. 13 November 2015 – Jesus: Men believe the Peace Treaties are real – they are not; they are false, to deceive many leaders. Iran has nuclear weapons, but they have been moved to another land. 1 November 2015 – Jesus: An Asteroid, hidden by God, will hit the ocean and will be seen only a few days before. This Asteroid will cause much damage to mankind. 19 September 2015 – Our Lady: The revolution in Europe will soon ignite, as men of power will reject our little children from entering their land. The continent of Africa will soon burn, as war will rage in many lands. 5 September 2015 – Jesus: Russia will strike when Europe is at its weakest. Revolution will come to America. 13 July 2015 – Our Lady: A major earthquake will hit Rome. Francis will be taken ill and mankind will believe he is dying. Jesus then gave directions: India will have great trials with racial and class violence: Riots and divisions between Hindus and Muslim. This will flow into Christians being persecuted in the Goa Region. 13 June 2015 (720) – Jesus and Mary: The enemy will strike, starting in the Ukraine – Italy, Poland and Europe. Istanbul and Turkey shall become a graveyard. 12 June 2015 – Jesus: Suffering to the children of the Island of Taiwan. 16 May 2015 (717) – Greater chastisements are coming also to Australia. 17 April 2014 (714) – Our Lady: There is an evil plan by the Bishops – a Document of Alliance for all Priests to sign – forcing the Clergy to give their allegiance to Pope Francis. War will break out soon in the Pacific Region. There will be a Crash in the Monetary System in Asia, to introduce the new currency and the New World Order. The City of Sydney is to be hit by a tidal wave – a major earthquake. 8 April 2015 (712) – Jesus: Russia is to be the scourge of Europe; Islamic Nations will cause much suffering to the Free World. 3 April 2015 (711) – Jesus: The Stars will change position and reveal a Great Mystery hidden from man since time began. Great upheavals – Earth will revolt. 16 January 2015 (708) – Our Lady: Don’t be misled by the one who sits on the Throne of Peter; an event in Israel shortly will show events are near. 31 October 2014 (706) – Jesus: Brisbane, Cairns, Sydney, Wollongong, Port Augusta in South Australia, Melbourne, Inner West of New South Wales and the Sunshine Coast of Queensland, will be hit by God’s Wrath very soon, with greater storms than ever before. 8 September 2014 – Jesus: The wars will multiply; the U.S.A. invaded – so will Australia and Europe at the borders of Poland, Sweden and Italy; Korea and Japan will also be drawn in. 11 July 2014 (703) – Jesus: You are approaching a Great Conflict, where millions of souls will be removed from the Earth in a moment of time. Should Israel invade the Palestinian State, the Middle East will explode.